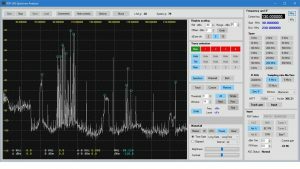 Steve, the Australian developer of the SDRplay Spectrum Analyser Software, has been quiet for a few months. But during that time he has been extremely busy working on the beta release which looks like it may become available in February. “Many apologies for not responding to earlier queries over the past couple of months. I have been totally absorbed with getting the next version ready. Anyway, the good news is that I hope to have a beta release ready before the end of February. The software is currently 95% complete with only a few small things left to sort out…….. If you go to the Spectrum Analyser thread on the SDRplay Forum , you can see that Steve has provided more screenshots and says he’ll keep us posted with further updates.